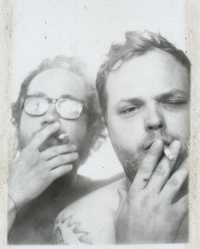 Water Liars enjoy a smoke. RIYL. That stands for Recommended If You Like, and it’s used by lazy journalists like me to describe bands by comparing their music to another band’s or performer’s music. It’s handy, but frowned upon by a lot of artists because it’s thought to marginalize and diminish their own creativity efforts. Here’s how it works. Water Liars are playing tonight at Slowdown Jr. RIYL: Will Johnson (Centro-matic), The Bruces, David Bazan (Pedro the Lion), M. Ward, Okkervil River, Will Oldham… and so on. The duo’s new album, Phantom Limb (released by Misra Records) is pretty fantastic. This show flew under the radar for me, I had no idea it was coming up. Go. Opening is Midwest Dilemma. 9 p.m., $7. BTW, I think there are something like 1.26 billion people playing solo acoustic shows somewhere on any given night.